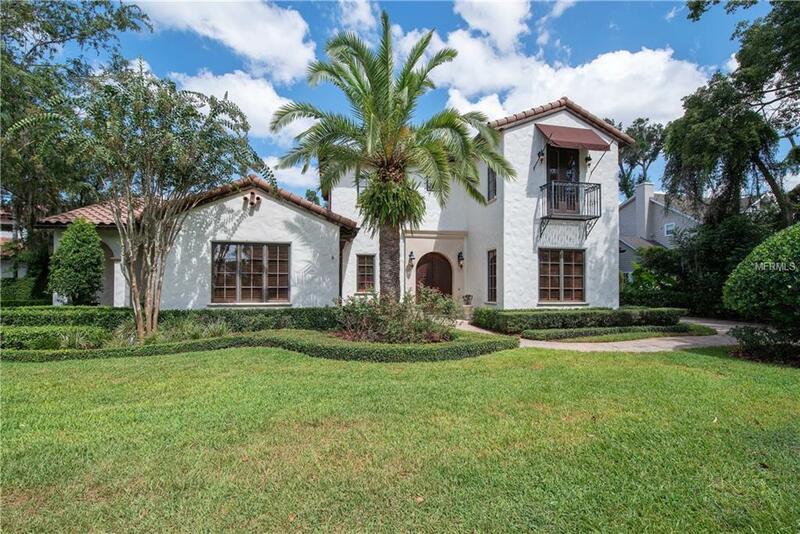 This stunning modern Mediterranean estate is situated on an oversized corner lot and on a beautiful brick street in a sought-after neighborhood, with convenience to ICC, YMCA and Phelps Park. You will find elegant style with character and quality throughout this custom-designed residence. There are five bedrooms with a lavish master retreat downstairs along with additional bedroom/guest suite, while three bedrooms and a bonus/media room are upstairs. The gourmet chef's island kitchen comes with commercial style stainless steel appliances, sleek contemporary cabinetry, separate breakfast room and friends/family side entry. The home is ideal for entertaining with elegant formal dining and living rooms, walk-in wine cellar, wine refrigerator and generous gathering room with full bar, fireplace, built-ins and more. Additional features include gorgeous hardwood and travertine flooring throughout, custom carved Old World doors, high ceilings, beams, fireplace and more. Outside is an exquisite backyard, tropical pool and spa, and mature premium landscaping. You will also find Pella windows and doors, three garages and motor court with expansive grounds and park-like setting. Listing provided courtesy of Premier Sothebys Intl. Realty.